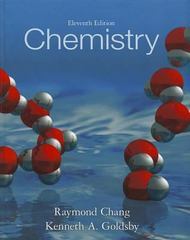 Chemistry 12 Edition Chang's best-selling general chemistry textbook takes a traditional approach and is often considered a student and teacher favorite. The book features a straightforward, clear writing style and proven problem-solving strategies. It continues the tradition of providing a firm foundation in chemical concepts and principles while presenting a broad range of topics in a clear, concise manner.The tradition of Chemistry has a new addition with co-author, Kenneth Goldsby from Florida State University, adding variations to the 12th edition. The organization of the chapter order has changed with nuclear chemistry moving up in the chapter order.